If you’ve invested in an ASUS ROG Gaming Laptop for the ultimate combination of Power & Portability so you can play your favourite games anywhere, you need something to carry it around in that compliments the performance, features & style that ASUS Republic of Gamers is known for. 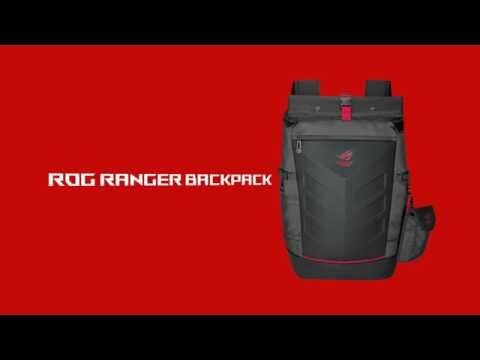 Enter the ROG Ranger Backpack. Specially designed for ASUS ROG Gaming Laptops & Notebooks up to 17.3”, the ROG Ranger Backpack is the best way to transport your mobile battle station between sessions of hunting loot, training skills & destroying adversaries in the virtual world - whenever you need to relocate your area of operations in the real world. Providing plenty of space for your peripherals, the ROG ranger ensures no peripheral is left behind, with a detachable internal accessories panel, & removal side pocket, in addition to the main compartment & 17” Zippered Laptop pocket. The roll top design gives you added flexibility to increase capacity on demand. Those that worry about their prized system getting wet, fear not, as the ROG ranger features a Built-in rain cover that can be pulled out from the bottom, up & over the backpack covering it & protecting it from the rain. For the security conscious, the backpack incorporates a hidden security pocket within the Soft ventilated back panel, while an integrated security lock on key zip compartments helps restrict unauthorised access to your gaming arsenal. Features • 36L backpack measuring 37.5 by 20 by 54cm. • Roll top design increases internal capacity to 42L if required. • Built-in rain cover with the ROG logo for wet weather use. • Ergonomically-designed wide shoulder straps and soft ventilated back panel. • Removable side pocket and storage panel for smaller items and accessories. • Fits up to 17-inch notebooks. • Max. Laptop Size: 17.3"
• Colour: Black & Red. • Capacity: 36L, Expandable to 42L. Important - Please Note: Laptop, Tablet, Peripherals, Notebook, etc, Not Included.